Microwave ovens cook from the inside out by making the water molecules in food vibrate, producing heat. They are very cost effective (compared to ovens and hobs), when cooking or reheating meals, baking potatoes or even making fudge! EcoFrenzy shows you tips on how to save money, energy and the environment when using a microwave oven. Boiling vegetables in water uses up to 4 times more energy on an electric hob than in a microwave (with a minimum of water), saving up to 6p per time. 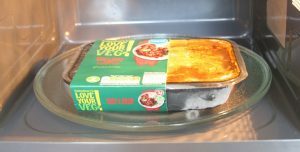 If you microwave vegetables 4 times a week this will save around £13 per year = 42 kg of CO₂. Baking 2 medium sized potatoes in a 2KW electric oven for 1 hour costs around 7p. 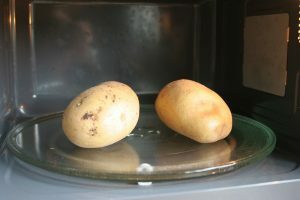 Cooking the same 2 potatoes in a 1200W microwave for 11 minutes costs around 3p. If you baked 2 potatoes twice a week for a year that means a saving of £4 = 14kg of CO₂. When purchasing a new microwave oven, search for these money saving and environmentally friendly features. Enter the weight and (with some models) type of food, and the microwave automatically selects the oven temperature, microwave power output and optimum cooking time. Simply input the food’s weight and the microwave sets the best program. Variable setting ovens allow you to choose the power setting needed to prepare food. Settings run from ‘High’ to ‘Low’ on most ovens. Setting can also be shown as wattages for example ranging from 900W to 250W.